Los Angeles – Every year event host Kevin Rouse and his Rouse House Entertainment crew produce some of Los Angeles’ most memorable special events and from the looks of February, this year will be no different. 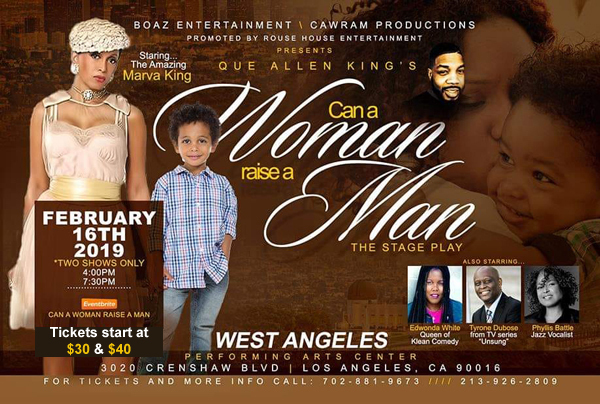 Rouse, in conjunction with playwright and creator Que Allen King and Lawrence Bailey Entertainment, are setting off Black History Month in a big way as they bring, direct from the Las Vegas Strip, the stage play, “Can A Woman Raise A Man” to the West Angeles Performance Arts Center. The play will run for two shows only, on Saturday, February 16, 2019 at 3:00 p.m. and a celebrity red carpet at 6:00 p.m. with the evening performance at 7:30 p.m. The West Angeles Performance Arts Center is located 3020 Crenshaw Blvd. “Can A Woman Raise A Man” is internationally renowned for being the first African American stage play with residency on the Las Vegas Strip. Tickets are available at https://www.eventbrite.com. “Can A Woman Raise A Man” is a compelling story of hope, health and healing through an amazing combination of drama, laughter, poetry, singing and music from a myriad of genres. The cast stars include the amazing Marva King, known for her legendary role in Tyler Perry’s “Diary of a Mad Black Woman”; Edwonda White, the Queen of Clean Comedy; Tyrone DuBois, (TV One’s Unsung); and a cameo appearance by legendary jazz singer Phyllis Battle. “Can A Woman Raise A Man” was originally a book that King actually wrote while he was homeless and squatting in an abandoned apartment building. He would sneak into a computer lab to work and writing became a cathartic experience for him. The play was born after the success of the book. King is the director of PLAY Magazine, a leading magazine covering urban theater around the world. He has also been inducted into the Walker African-American Museum & Research Center in Las Vegas. In addition to “Can A Woman Raise A Man,” Rouse launches Black History month with internationally acclaimed musician The Funky Sax Man Chazzy Green & The Greenbacks with special guest, Hollywood Walk of Famer, Ray Parker Jr. at the Catalina Bar & Grill Jazz Club on Tuesday February 5, 2019. Rouse can be reached for bookings on Facebook at @Kevin Rouse. For additional show information call (213) 926-2809 or (702) 881-9673. Over the years the principals at the Jazzmyne agency have represented a host of high-profile individuals and campaigns including: comedians, Jamie Foxx, Mo’Nique and J. Anthony Brown; actor, Dorien Wilson, musician, The Tonight Show’s Kevin Eubanks, athletes, Wayman Tisdale and Nick Van Excel, rapper, Mystical; author and radio personality, Michael Baisden; and civil rights legend, Dr. Joseph Lowery.